Doing exercise, starting a workout program, creating a balanced routine is hard enough but the muscle soreness that comes with all this makes it difficult to stay on track. Doing any physical activity, particularly which is new to your body causes muscle soreness. Muscle go through physical stress when we exercise so mild soreness is just a natural outcome of any kind of physical activity. Delayed Onset Muscle Soreness is defined as gradually increasing discomfort that occurs between 24 and 48 hours after activity and it is perfectly normal. It occurs when the muscle is performing an eccentric or a lengthening contraction which results in small microscopic tears in the muscle. 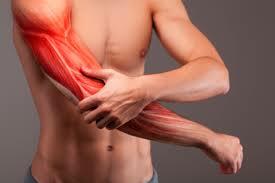 No one is immune to muscle soreness even bodybuilders experience delayed onset muscle soreness. The muscle discomfort is simply a symptom of using your muscles, which stresses your muscles and make them stronger so that next time the same task can be performed in a better way. If a person is new to exercise program than he needs a guide. As they are not very fit and get all excited to start a new class and the instructors do not tell them that they might get sore. They might feel very sore and would not repeat it again as they might think that they have hurt themselves. There is no panacea for DOMS but several remedies such as ice, rest, anti-inflammatory medication, massage, heat, and stretch are useful in relief from it. It takes few days while your body adapts, so try easy exercises such as walking and swimming. Keeping the muscle in motion can also provide some relief. Before finishing exercise program include 10 minutes easy aerobic workout such as jogging or waking followed by stretching. According to studies, it is shown that heat remedies treat muscle soreness. When muscle temperature is increased, blood flow increases, bringing fresh oxygen and healing nutrients to the injured site. This increased blood flow also helps to wash away the chemical irritants responsible for pain. If someone does any activity then the next time they do the activity, there will be less muscle tissue damage, less soreness, and a faster strength recovery. It is important to distinguish the difference between moderate soreness induced by exercise and muscle overuse or injury.